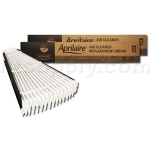 Aprilaire #613 High Efficiency Filtering Media - 16" x 25"
This highly efficient filter media fits common 16" X 25" Air Cleaners after they have been upgraded using the Aprilaire 4897 Upgrade Kit. This kit upgrades air cleaner cabinets from Carrier, Honeywell, Lennox, Ultravation, General, Trion, and others. NOTE: This filter can only be used after your air cleaner is upgraded using the 4897 rails! Saves space in your cramped mechanical room! Compare collapsed dimensions of 4-1/4" X 4-3/4" X 27" with 16" X 25" X 5"! !